Listen in as we review the films Diary of a Wimpy Kid: The Long Haul including the red carpet event in Indianapolis, Everything, Everything, The Cat in the Hat Knows A Lot about Camping and Digimon Adventure Tri: Reunion. Hosts Keefer Blakeslee and Gerry Orz are joined by KIDS FIRST! Film Critics Ryan, Ella, Benjamin, Alejandra, Maria, and Morgan! Before you spend your hard earned dollars at the movies, be sure to listen to what our youth reporters have to say. Listen in as we interview Geoff Ramsey and his daughter, Millie, founder of Rooster Teeth’s Achievement Hunters, Season 2, Schooled as well as actress Francesca Capaldi of Max 2: White House Hero and review Guardians of the Galaxy Vol. 2, King Arthur: Legends of the Sword and Celebrities to the Rescue. Hosts Keefer B and Morgan B. are joined by KIDS FIRST! Reporters, Benjamin and Nathaniel. Before you spend your hard earned dollars at the movies, listen to what our youth reporters have to say. 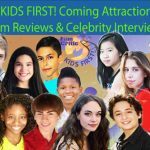 Listen in as we interview voice actress Amber Frank about her role in the animated film, Spirt: Riding Free, review the films Guardians of the Galaxy Volume 2 and The Wedding Plan and tell you all about KIDS FIRST! Film Critics Boot Camps taking place this summer! Hosts Gerry O. and Keefer B. are joined by KIDS FIRST! Reporters Clayton, Kamhai and Morgan. Before you spend your hard earned dollars at the movies, listen to what our youth reporters have to say. Listen in as we review the films Born in China, Dino Dan: Dino Go Seek, The Fate of the Furious, Floogals: Destination Planet Earth, Once Upon a Sign: The New Boy Who Cried Wolf and tell you all about the recent Star Wars Celebration! Hosts Morgan B. and Mia A. are joined by KIDS FIRST! Film Critics Benjamin, Rohan and Shelby. Before you spend your hard earned dollars at the movies, listen to what our youth reporters have to say. You are currently browsing the KIDS FIRST! Radio weblog archives for May, 2017.